The pie chart below represents the main reasons why agricultural land becomes less productive. The bar chart shows how these causes affected three regions of the world in the 1990s. The pie chart displays the primary reasons for agricultural land loss worldwide as a percentage, whereas the bar chart shows the proportion of land degraded per region attributed to these same causes during the 1990s. Overall, although the three primary reasons for worldwide agricultural land loss affect the globe approximately equally, their effects are more varied at a regional level. On a worldwide scale, over-grazing is the foremost factor in losing agricultural land accounting for 34% of total land degradation, followed closely by over-cultivation (28%), deforestation (30%) and least of all by salinization at 8%. During the 1990s, the regional effect of the three main causes of loss of land varied. Europe was the worst affected overall, losing over a fifth of its farmland primarily to deforestation and over-cultivation at 8.4% and 7.7% respectively. Oceania was the next most affected with almost 14% of land lost mostly due to salinization (10.8%). Least of all affected was North America (8%) where deforestation and over-cultivation taken together were equally responsible for 6% of degraded land there. Be careful to note the details of each graph. The pie chart describes the typical main land loss causes worldwide; whereas, the bar chart details land loss as a percentage of total land per region. Data is from the 1990s, so remember to use past tense later paragraphs. While the impact of land degradation causes are much more varied at the regional level than the international one, this can also be a key contrast. Be sure to go over your writing after you finish to check for grammar and repeated information to check you don’t write more than you need. Make sure to show comparisons in your writings. Restate the time at the start to show that we’re discussing a case study. Give a trend at the start, then detail in subsequent sentences. State the highest result total and key highlights. State the second highest and worst results together with highlights. The pie chart display the primary reason for agricultural land losses worldwide as a percentage, whereas the bar chart show the proportion of land degrade per region attributed these same causes during the 1990s. Overall, although three primary reason for worldwide agricultural land loss effects the globe approximately equally their effects is more varied at regional level. 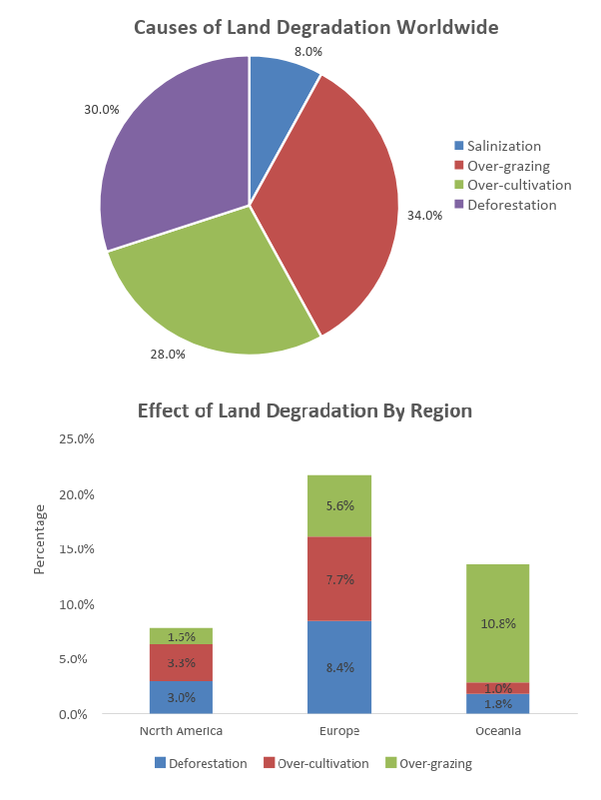 On a worldwide scale, over-grazing is the foremost factor in losing agricultural land accounting 34% of total land degradation, followed close by over-cultivationing (28%), deforestationing (30%) and least of all by salinizationing at 8%. During the 1990s, the regional effect of the three main cause of loss of land varied. Europe was worst affected overall, losing over fifth of its farmland primarily to deforestation and over-cultivation at 8.4% and 7.7% respective. Oceania was next most affected with almost 14% of land lost mostly due to salinization (10.8%). Least of all affected were North America (8%) where deforestation and over-cultivation taken together were equally responsible for 6% of degraded land there. Look at the pie chart. Which causes are responsible for the most land degradation around the world? Can any of the causes be grouped together? Which one results in the least land destruction? Look at the bar chart. Which region is the most/least affected by these causes? Notice how there is much variation between each region. This is in contrast to worldwide figures wherein degradation factors tend to roughly equally affect farmland. Now make your own plan using the above questions. Land degradation affected more or less equally by separate causes worldwide, their effects are much more varied at a regional scale. Over-grazing principle cause, followed by deforestation and over-cultivation.